Our Paschal Calendar gives us three illustrious Virgins of the beautiful Italy. 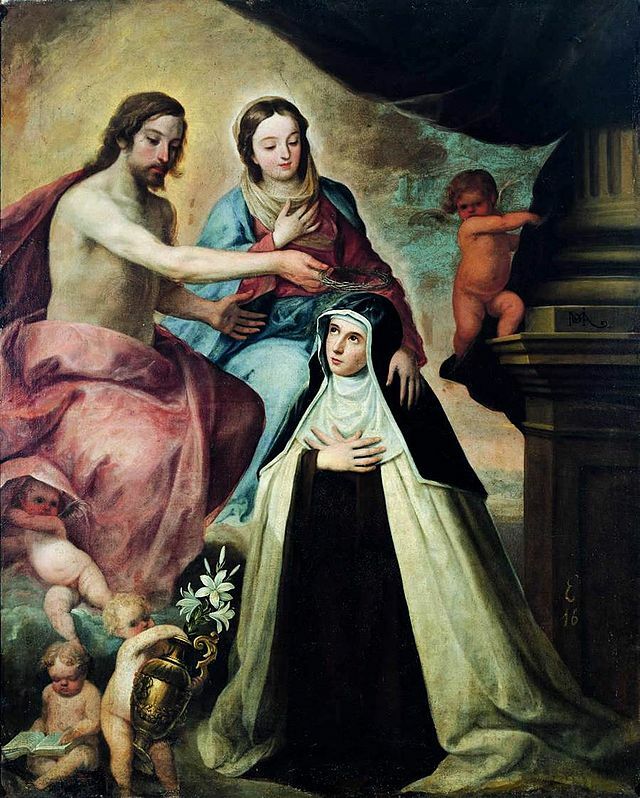 We have already kept the feast of the valiant Catharine of sienna; in a few days, we shall be honoring the memory of Angela de Merici, surrounded by her school-children; today, it is the fair lily of Florence, Magdalene de Pazzi, who embalms the whole Church with the fragrance of her name and intercession. She was the loving imitatrix of our Crucified Jesus; was it not just that she should have some share in the joy of his Resurrection? Magdalene de Pazzi was one of the brightest ornaments of the Order of Carmel, by her angelic purity, and by the ardor of her love for God. Like St. Philip Neri, she was one of the grandest manifestations of the Divine Charity that is found in the true Church. Magdalene in her peaceful Cloister, and Philip in his active labors for the salvation of souls—both made it their ambition to satisfy that desire expressed by our Jesus, when he said: I am come to cast fire on the earth; and what will I, but that it be kindled? The life of this Spouse of Christ was one continued miracle. Her ecstasies and raptures were almost of every day’s occurrence. The lights given to her regarding the Mysteries were extraordinary; and in order to prepare her for those sublime communications, God would have her go through the severest trials of the spiritual life. She triumphed over them all; and her love having found its nourishment in them, she could not be happy without suffering; for nothing else seemed to satisfy the longings of the love that burned within her. At the same time, her heart was filled to overflowing with charity for her neighbor: she would have saved all mankind, and her charity to all, even for their temporal well-being, was something heroic. God blessed Florence on her account; and as to the City itself, she so endeared herself to its people by he admirable virtues, that devotion to her, even to this day, which is more than two hundred years since her death, is as fervent as ever it was. One of the most striking proofs of the divine origin and holiness of the Church is to be found in such privileged souls as Magdalene de Pazzi, on whom we see the Mysteries of our salvation acting with such direct influence. God so loved the world, as to give it his Only Begotten Son; and this son of God deigns to love some of his creatures with such special affection, and to lavish upon them such extraordinary favors that all men may have some idea of the love wherewith his Sacred Heart is inflamed for this world, which he redeemed at the price of his Blood. Happy those Christians that appreciate and relish these instances of Jesus’ special love! Happy they that can give him thanks for bestowing such gifts on some of our fellow creatures! They have the true light; whereas they that have an unpleasant feeling at hearing of such things, and are angry at the thought that there can be an intimacy between God and any soul of which they are not worthy—this class of people prove that there is a great deal of darkness mixed up with their faith. We regret extremely that we have space for a fuller development of the character and life of our Saint. We therefore proceed at once to the Lessons given in her Office. Even they are too short, and give us but an imperfect idea of this admirable Spouse of Christ. Maria Magdalena, illustriori Pazziorum genere Florentiæ nata, fere ab incunabulis iter perfectionis arripuit. Decennis perpetuam virginitatem vovit, susceptoque habitu in monasterio Sanctæ Mariæ Angelorum ordinis Carmelitarum, se omnium virtutum exemplar exhibuit. Adeo casta fuit, ut quidquid puritatem lædere potest, penitus ignoraverit. Quinquennium, Deo jubente, solo pane et aqua transegit, exceptis diebus Dominicis, quibus cibis Quadragesimalibus vescebatur. Corpus suum cilicio, flagellis, frigore, inedia, vigiliis, nuditate, atque omni pœnarum genere cruciabat. Mary Magdalene was born at Florence, and was of the illustrious family of the Pazzi. It might be said of her that she entered the way of perfection when a babe. When ten years of age, she took a vow of perpetual virginity; and having taken the habit in the Carmelite Monastery of Our Lady of the Angels, she became a model of every virtue. Such was her purity, that she utterly ignored everything that is opposed to that virtue. She received a command from God, which she fulfilled, of fasting on bread and water for five years, Sundays alone excepted, on which she might partake of Lenten diet. She mortified her body by a hairshirt, discipline, cold, abstinence, watching, want, and every kind of suffering. Tanto igne divini amoris æstuabat, ut ei ferendo impar, ingesta aqua pectus refrigerare cogeretur. Extra sensus frequenter rapta, diuturnas et admirabiles exstases passa est, in quibus et arcana cœlestia penetravit, et eximiis a Deo gratiis illustrata fuit. His autem munita longum certamen a principibus tenebrarum sustinuit, arida, desolata, ab omnibus derelicta, variisque tentationibus vexata; Deo sic permittente, ut invictæ patientiæ, ac profundissimæ humilitatis exemplar præberet. Such was the ardor of divine love that burned within her, that not being able to bear the heat, she was obliged to temper it by applying cold water to her breast. She was frequently in a state of rapture, and the wonderful ecstasies she had were almost daily. In these states, she was permitted to penetrate into heavenly mysteries, and was favored by God with extraordinary graces. Thus strengthened, she had to endure a long combat with the princes of darkness, as also aridity, abandonment by all creatures, and divers temptations: God so willed it, that she might become a model of invincible patience and profound humility. Charitate erga proximum singulariter enituit; nam sæpe noctes ducebat insomnes, vel obeundis Sororum ministeriis, vel inserviendo infirmis occupata, quarum aliquando ulcera lambens sanavit. Infidelium et peccatorum perditionem amare deflens, se ad quælibet pro illorum salute tormenta paratam offerebat. Multis ante obitum annis, universis cœli deliciis, quibus copiose affluebat, heroica virtute renuntians, illus frequenter in ore habebat: Pati, non mori. Tandem longa et gravissima infirmitate exhausta, transivit ad Sponsum die vigesima quinta Maii anno millesimo sexcentesimo septimo primo ætatis suæ. Eam multis in vita et post mortem miraculis claram Clemens Nonus sanctarum Virginum numero adscripsit: cujus corpus in præsentem diem incorruptum conservatur. She was remarkable for her charity toward others. She would frequently sit up the whole night, either in doing the work of the Sisters, or in waiting upon the sick, whose sores she sometimes healed by sucking the wounds. She wept bitterly over the perdition of infidels and sinners, and offered to suffer every sort of torment, so that they might be saved. Several years before her death, she heroically besought our Lord to take from her the heavenly delights wherewith he favored her; and was frequently heard saying these words: “To suffer; not to die.” At length, worn out by a long and most painful illness, she passed hence to her Spouse, on the twenty-fifth of May, in the year 1607, having completed the forty-first year of her age. Many miracles having been wrought by her merits, both before and after death, she was canonized by Pope Clement the Ninth. Her body is, even to this day, preserved from corruption. Thy life here below, O Magdalene, resembled that of an Angel, who was sent by God to assume our weak and fallen nature, and be subject to its laws. Thy soul was ceaselessly aspiring to a life which was all heavenly, and thy Jesus was ever giving thee that thirst of Love which can only be quenched at the waters of life everlasting. A heavenly light revealed to thee such admirable mysteries, such treasures of truth and beauty, that thy heart—unequal to the sweetness thus given to it by the Holy Ghost—sought relief in sacrifice and suffering. It seemed to thee, as though there was but one way of making God a return to his favors—the annihilation of self. Seraphic lover of our God!—how are we to imitate thee? what is our love, when we compare it to thine? And yet, we can imitate thee. The year of the Church’s Liturgy was thy very life. Each of its Seasons did its work in thee, and brought thee new light and love. The divine Babe of Bethlehem, the bleeding Victim on the Cross, the glorious Conqueror of Death, the Holy Ghost radiant with his seven gifts—each of these great Realities enraptured thee; and thy soul, renewed by the annual succession of the Mysteries was transformed into Him who, that he might win our hearts, gives these sublime celebrations to his Church. Thy love of souls was great during thy sojourn here; it is more ardent now that thou art in possession of the Sovereign Good;—obtain for us, O Magdalene, light to see the riches which enraptured thee, and love to love the treasures which enamored thee. O riches! O treasures! is it possible that they are ours too?